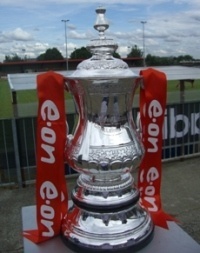 Following their disappointing 1-1 draw with Royston last Saturday, Wembley FC lost their FA Cup Extra Preliminary Round replay this week to exit the competition at the first hurdle. Despite starting the ties as favourites, the Combined Counties Premier Division side lost the replay 4-0 at Royston’s Garden Walk ground. A positive display at Wembley in the first tie obviously gave Royston a lot of confidence and they tore into their opponents from the off. Goals from Conor De Lacy, Ryan Lockett and two from Craig Hammond put paid to Wembley’s hopes and their journey on the road to Wembley ended almost as soon as it had begun. Royston manager Paul Attfield told their club’s website: "It was a great win and one that I thought was thoroughly deserved. "Our work rate and pace was extremely high all night, and Wembley really struggled to contain that. "Saturday’s game gave us a lot of confidence and showed that they were very beatable. "I thought that we should have won that game, and was confident that we could get the result at Garden Walk. "Two early goals put us in a good position, and the third really killed them off. "All four goals were very good, but Craig’s first had a lot of people talking as it was a great strike." A detailed write-up on the game is available to view at The Road From Wembley - a blog by football fan John Stoneman who will be watching one game in every round of the competition this season.